Main Principles of Work with Virtual Client. 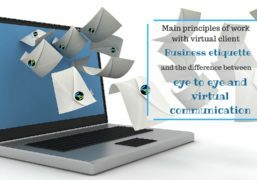 Business Etiquette and Difference between Eye To Eye and Virtual Communication. Part one. Nowadays, about 50% of all business communications are being performed through various kinds of correspondence on the Internet: Skype, ICQ, e-mail, various extranets. In addition, there are business social networks, online magazines, news portals, business ads dashboards, video libraries and other business information resources. Moreover, we get the most part of incoming information from these resources during the working day. 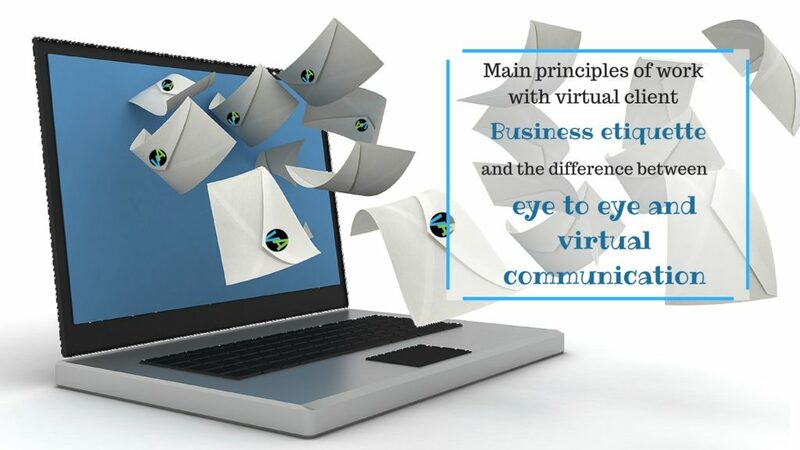 The first step of the work with virtual client is an e-mail communication. This is one of the most important, common used and popular means of business communication. This way to communicate is especially relevant for those whose work requires performing conversations with large number of partners and customers, for example, virtual assistants or virtual teams. If you want to be sure of the effectiveness of the sent messages, take the following tips to consideration. They were created due to the information, shared by the experienced virtual assistant and are suitable not only for e-mail communication, but for many different kinds of communication with virtual client, considering the rules of netiquette and business etiquette. 1. Make sure that your letter has no mistakes. Wrong punctuation, grammatical or spelling deficiencies or mistakes may undermine the credibility of you and your organization by the recipient. In addition, this could make your message difficult to read. You can use the function of checking the text in a text editor, because this is what they were made for. Virtual assistant can take this task as one of his duties, and you wouldn’t be bothered with such problem. 2. Don’t use Caps Lock key while writing your e-mail message. When you’re using capital letters for each letter of the word in a message to the partner, it seems like if you were shouting during a business meeting. This can make your partner nervous. So decide whether you want to annoy the person you are writing to. 3. When replying to a previously received message, include the content of the previous message into yours. Your recipient can forget the details of the previous listing, and, as a result, he will miss the main point of your message. 4. Beware of the “reply to all” option, except the situation when you really intended your letter to be sent for all contacts from your contact list. You can get into an awkward situation, but what’s even worse, you can send some information to those who doesn’t have proper access to it and break the rules of business etiquette. 5.Try not to use abbreviations (often abbreviations that are commonly used in the lexicon of one exact region could be totally unfamiliar to people from another region). Also, avoid using emoji, as they could be suitable only for personal correspondence. Of course, your friendly sociability will be appreciated, but it may be risky for the opportunities of further cooperation, because you can present yourself not serious enough for business. 6. Make the sentences in the text briefly and concisely represent the information. As virtual assistant’s experience shows, the sentences should have a maximum length of 15-20 words. Remember that e-mail letters are still different from the traditional letters and usually perceived in a hurry, so don’t create additional troubles to your recipient. 7. Make no delay with the answer. If you receive a message, but you cannot answer it immediately due to some reasons (for example, you were offline), it is desirable to respond as soon as possible or, at least, within 24 hours, according to business etiquette rules. Even if you see that your recipient isn’t online, still don’t make delays with the answer. 8. Be patient. Remember that your conversation partner is at the office, so he can be busy talking on the phone, communicating with company’s managers or clients. Have patience, don’t bother your business partner or colleague every minute, you’d better wait until he will be able to answer. If you have a very urgent question, but his status “Busy” is on – ask when he will be able to pay attention to you. This is right according the rules of netiquette. 9. Give your conversation partner enough time to answer. Don’t demand the answer immediately, let the other party have time to think. If a person has the “Online” status, this does not mean that your partner doesn’t need time to “digest” the information, to choose the right version of the answer. Do not ask again, do not overload with other issues or questions and the communication process will become easier and understandable to both sides. 10. The last, but not the least rule of effective communication: remember that you are talking to a real person. When you’re using virtual means of communication, you are dealing with a computer or smartphone screen. You can not gesticulate, change the tone, and the facial expression does not make any sense for your conversation partner (not considering Skype and videoconferences, of course). Words and only words – that’s all what he sees. When you have an ongoing conversation – via e-mail – it is very easy to make a mistake in the interpretation of the words of your conversation partner. Don’t forget that your recipient is an individual with real feelings and habits. The basic tips above are easy to follow, but people tend to miss them. This leads to the spoiling the process of virtual communication, making it stressful and difficult. Take the tips into account or spread them among your virtual teams. You and your business will have more chances to achieve prosperity and success. You can find the more information on this topic in the second part of this article in our blog.